Laying hens need proper nutrition, clean and well-ventilated housing, and protection from predators in order to continue laying. 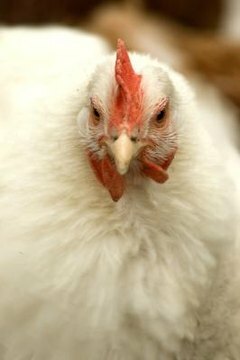 Problems with laying hens often occur because of flock mismanagement, diseases or stress. Many problems can be alleviated with some simple changes in the hens' diet or lifestyle, but if the problem isn't solved by these changes, it may be time to retire a laying hen and find a replacement. Egg eating is a major problem among laying hens and must be addressed quickly. Egg eating is different from eggs disappearing from the nest; if eggs disappear, check for snakes or other predators stealing them. Egg eating occurs when hens taste the contents of a broken egg. Once tasted, the hen continues eating her own eggs. Many hens cannot be broken of this habit once it starts, so it is better to prevent egg eating by removing fresh eggs quickly and preventing accidental breakage by safeguarding nesting boxes and fencing off hen yards. Hens stop laying eggs for many reasons. Hens need approximately 14 hours of daylight per day to lay eggs. You can supplement their light with artificial lights in the hen house to encourage them to lay eggs again. Hens need food that is about 16 to 18 percent protein, so check their feed to make sure they are receiving adequate nutrition. Hens stop producing eggs when they molt, or lose their feathers. Hens usually begin molting in late summer or early autumn. Some chickens molt starting around 4 months of age, while others won't begin to molt until they are at least a year old. The molting process can take weeks or months. Once hens complete their molting cycle, they may begin laying again. One of the first signs of egg drop syndrome is intermittent diarrhea. Hens may seem listless or tired. Their egg quality declines, and eggs may have thin shells which break easily. Egg production declines until the hens stop laying eggs entirely. Egg drop syndrome is thought to be transmitted by contaminated vaccine. Virginia Cooperative Extension: Why Have My Hens Stopped Laying?